Since the 1830s, Methodists have been worshipping in Milwaukee. This faith tradition encompasses a variety of denominations, including many congregations that have traditionally served particular ethnic, racial, and linguistic groups. Some of these denominations exist today, including many historically black churches, while others have merged into larger communions. The largest Methodist denomination in the nation and the region, the United Methodist Church (UMC), was formed in 1968 by the union of the Methodist Church and the Evangelical United Brethren communion. The nine-county South East District of the UMC, including the greater Milwaukee area, consists of 109 churches. In 2010, forty-five of these churches and over 17,000 parishioners were in the four-county Milwaukee area. About 5,000 additional Methodists in the region worshipped in the historically black African Methodist Episcopal, African Methodist Episcopal Zion, and Christian Methodist Episcopal churches. In the winter of 1834 to 1835, Methodist circuit rider John Clark passed through Milwaukee en route to his Green Bay posting. Clark decided that the growing Milwaukee settlement merited a missionary and arranged for Mark Robinson of the Methodist Episcopal church to journey north from Illinois. The first Methodist service was held in the log cabin of Milwaukee doctor Enoch Chase in June 1835, and in the fall Robinson was officially appointed to the Milwaukee circuit. Following early meetings in members’ homes, the young congregation met in a carpenter shop at the corner of Huron and Water streets. In 1837 the church was chartered with the city; it dedicated its first church building, near the corner of Broadway and Wells, in 1841. Only four years later, the congregation dedicated a new church at the intersection of Plankinton and Wisconsin. Office space at street level housed the new city hall offices, a building in which Solomon Juneau took his oath of office as Milwaukee’s first mayor. As Milwaukee grew, Methodist Episcopal churches were organized in Walker’s Point and in downtown’s East Side. (The latter would eventually become Summerfield United Methodist.) Milwaukee’s West Side congregation, originally named the Methodist Episcopal Church of Milwaukee, was later renamed Spring Street Methodist, Grand Avenue Methodist, First Methodist Church of Spring Street Station, and finally Central United Methodist. As migrants from the eastern states were building Milwaukee’s early Methodist Episcopal Churches, immigrant groups were establishing their own Methodist communities. German circuit rider John Lutz arrived in Milwaukee in January 1840. Originally preaching in a Granville home, Lutz founded the first local Evangelical Association class in Greenfield. 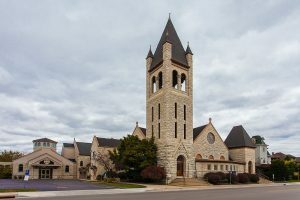 The Evangelical Association, a forerunner to the Evangelical United Brethren and the UMC, ministered especially to German immigrants in rural southeastern Wisconsin, but also established a Milwaukee congregation in 1846. 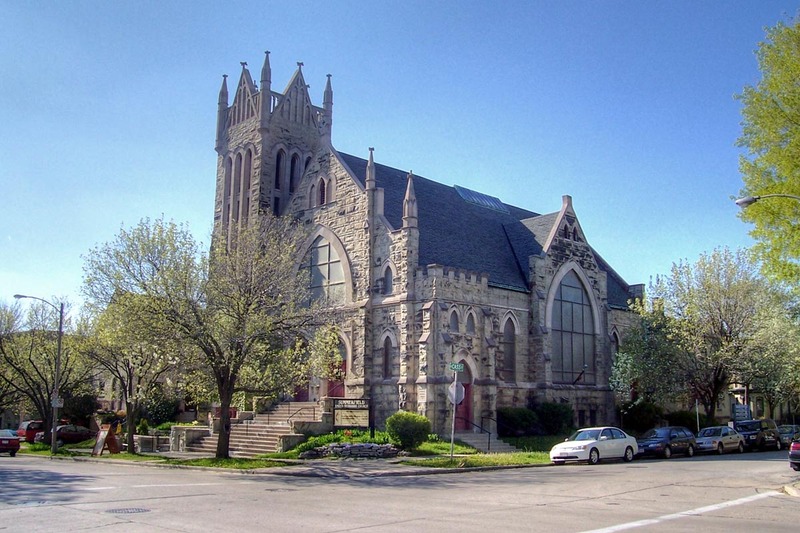 In the same year, Milwaukee’s first German Methodist Episcopal church was founded. A local German Methodist Episcopal district followed two years later and remained separate from the local English-speaking district until 1933. 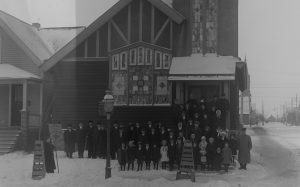 A Norwegian community grew within the Spring Street Station church before establishing its own congregation in 1865, and a Polish congregation was founded on the South Side in 1910. An Italian missionary communion, centered in the Third Ward with outposts throughout the region, emerged in the early 1900s. Connected to the Evangelical Association, this Italian congregation gained notoriety for its Americanization programs and World War I patriotism. These programs drew ire from local anarchists. Then in September 1917, August Giuliani, a former Catholic priest who now ministered to a Methodist congregation of Italians in Bay View, attempted to stage an open-air rally that mixed religion and patriotism; local anarchists scuffled with police and gunfire ensued. Two months later, a bomb was found near the Italian Methodist church. Brought to the local police station by a church member, the bomb exploded, killing ten people. The trials of the suspected Italian immigrants brought widespread attention to the church and Milwaukee’s Italian community. While Milwaukee’s immigrant Methodist congregations were often missions of the Yankee-Yorker Methodist organizations, the local African American Methodist communities incorporated many independent denominations. In 1869, St. Mark African Methodist Episcopal (AME) Church was founded as Milwaukee’s first African-American congregation. During the twentieth century, working class migrants from the South established additional Methodist congregations in the city. St. Matthew Christian (previously Colored) Methodist Evangelical (CME) was established in the 1920s; St. James Church, associated with the black Lexington Conference of the Methodist Church, was founded in 1948; and Clement Memorial AME Zion Church opened in the mid-1950s. The Milwaukee Institute of Theology, founded by African-American Protestant ministers in the 1960s, was originally housed in the basement of St. James Church. Across denominations, Methodists were involved in the fights for civil rights and integration. Several Methodist churches, including St. Matthew CME, St. Mark AME, and St. James, hosted Freedom Day Schools in the mid-1960s. Additional congregations fought for integration and several ministers were actively involved in the movement. In the 1950s and 1960s, the geography of Milwaukee Methodism began to shift. As white residents increasingly moved to the suburbs, new congregations were established by the predecessors of the UMC. The Evangelical United Brethren and the Methodists both started new mission churches in Milwaukee and Waukesha County suburbs. Simultaneously, many inner-city congregations merged, closed, or became mission congregations in minority neighborhoods. Methodist denominations actively embraced this missionary role. Northcott Neighborhood House, envisioned as a settlement house for black migrants from the South and named for the presiding Methodist bishop and his wife, opened at St. James Church in 1961. The following year, Methodist Children’s Services was established to provide aid to single mothers and their children. After Milwaukee’s civil unrest of 1967, the Methodist Church refocused its urban ministries under the new office of a Metropolitan Minister. In 1968, the United Evangelical Brethren and the Methodist Church combined to create the UMC, and by the late 1980s, the combined denomination ran over twenty social service programs in Milwaukee. Located at 2460 N. 6th Street, Northcott Neighborhood House remains one of the most prominent programs supported by the UMC. Northcott provides a variety of educational, neighborhood, and family services to the community. United Methodist Children’s Services offers family services and transitional housing in the Washington Park neighborhood. ^ William Blake, Cross and Flame in Wisconsin: The Story of United Methodism in the Badger State (Sun Prairie, WI: Commission on Archives and History Wisconsin Conference United Methodist Church, 1973), 31. ^ Association of Statisticians of American Religious Bodies, “U.S. Membership Report” (Association of Religion Data Archives, 2010), accessed March 31, 2017; Charles Yrigoyen, Jr. “United Methodism,” in Encyclopedia of the American Religious Experience: Studies of Traditions and Movements, ed. Charles H. Lippy and Peter W. Williams (New York, NY: Charles Scribner’s Sons, 1988), 539. ^ Association of Statisticians of American Religious Bodies, “Metro-Area Membership Report: Milwaukee-Waukesha-West Allis, WI, Metropolitan Statistical Area” (Association of Religion Data Archives, 2010), accessed February 13, 2017. ^ Blake, Cross and Flame in Wisconsin, 29. ^ Blake, Cross and Flame in Wisconsin, 30. ^ Blake, Cross and Flame in Wisconsin, 31. ^ J. Newton Colver, ed., One Hundred Years of Methodism in Greater Milwaukee (Milwaukee: E.F. Schmidt Co., 1935), 6, 27-28. ^ Colver, One Hundred Years of Methodism in Greater Milwaukee, 6. ^ Frank Abial Flower, History of Milwaukee, Wisconsin, from Pre-Historic Times to the Present Date, Embracing a Summary Sketch of the Native Tribes, and an Exhaustive Record of Men and Events for the Past Century; Describing in Elaborate Detail the City as It Now Is; Its Commercial, Religious, Educational and Benevolent Institutions, Its Government, Courts, Press, and Public Affairs; Its Musical, Dramatic, Literary, Scientific and Social Societies; Its Patriotism during the Late War; Its Development and Future Possibilities; and Including Nearly Four Thousand Biographical Sketches of Pioneers and Citizens (Chicago, IL: Western Historical Company, 1881), 816-818, Archives Unbound, accessed February 2, 2017. ^ 1852 to 1952 A Century of Service ([Milwaukee]: Summerfield Methodist Church, 1952), [4-6], accessed March 31, 2017. ^ Finding Aid for the Central United Methodist Church (Milwaukee, Wis.) Records, 1844-1973, Wisconsin Historical Society website, accessed March 31, 2017. ^ Blake, Cross and Flame in Wisconsin, 40-41. ^ Blake, Cross and Flame in Wisconsin, 41-43. ^ Blake, Cross and Flame in Wisconsin 42; Flower, History of Milwaukee, Wisconsin, 940. ^ Blake, Cross and Flame in Wisconsin, 58. ^ Blake, Cross and Flame in Wisconsin, 73, 202. ^ Colver, One Hundred Years of Methodism in Greater Milwaukee, 31; Susan Gibson Mikos, Poles in Wisconsin (Madison, WI: Wisconsin Historical Society Press, 2012), 19. ^ Anthony J. Farina, “I Must, I Must, I Must”: The Story of the Italian Evangelical Church of Wisconsin (Sun Prairie, WI: Wisconsin Conference United Methodist Church, n.d.), 32-33, 49-53, 61-62. ^ Farina, “I Must, I Must, I Must,” 78-80; Anna Passante, “Anarchy in Bay View,” Bay View Compass, November 5, 2008. ^ Farina, “I Must, I Must, I Must,” 78-86; Kevin J. Abing, A Crowded Hour: Milwaukee during the Great War, 1917-1918” (Charleston, SC: Arcadia Publishing, 2017), chapter five. ^ Joe William Trotter, Jr., Black Milwaukee: The Making of an Industrial Proletariat, 1915-45, 2nd ed. (Urbana, IL: University of Illinois Press, 2007), 31. ^ Trotter, Black Milwaukee, 130; Lois C. Olsen, All God’s Children: A History of African American Methodists (Milwaukee: Lois C. Olsen, 2007), 22; David V. Harsh, “A Fragmentary Look at Black Methodism in Wisconsin,” 19, David V. Harsh Essays, Milwaukee SC 155, University of Wisconsin-Milwaukee Archives. ^ Blake, Cross and Flame in Wisconsin, 277-278. ^ 14-1 Commemoration Day Program, May 17, 1964, March on Milwaukee Civil Rights History Project, accessed March 20, 2017, last accessed March 16, 2018. ^ See Finding Aid for Central United Methodist Church, 1974-1978, Milwaukee County Historical Society website, accessed March 31, 2017; and Oral History Interview with Rev. B.S. Gregg, May 30, 1995, March on Milwaukee Civil Rights History Project, last accessed March 16, 2018. ^ Blake, Cross and Flame in Wisconsin, 240-241, 272-273. ^ Blake, Cross and Flame in Wisconsin; Finding Aid for Central United Methodist Church (Milwaukee, Wis.) Records, 1844-1973; Gary William Bell, “Social Activism in United Methodist Local Churches: Individualistic and Structural Programs and the Role of the Church in American Society,” PhD diss., University of Wisconsin-Milwaukee, 1987, 118. ^ Blake, Cross and Flame in Wisconsin, 278-279; Olsen, All God’s Children, 29-31; “United Fund Membership Is Rejected,” Milwaukee Journal, July 26, 1963. ^ Blake, Cross and Flame in Wisconsin, 274; “About Us,” United Methodist Children’s Services of Wisconsin Incorporated website, http://www.umcs-wi.org/aboutus.html, accessed March 31, 2017. ^ Bell, “Social Activism in United Methodist Local Churches,” 114-116. ^ Bell, “Social Activism in United Methodist Local Churches,” 119. ^ “Northcott Neighborhood House Celebrated 53 Years of Service,” Wisconsin Conference United Methodist Church website, accessed March 31, 2017; “About Us,” Northcott Neighborhood House, March 31, 2017; Tom Tolan, “Weddle Honored for Years of Helping Community,” Milwaukee Journal Sentinel, October 28, 2011, last accessed March 14, 2018. ^ Blake, Cross and Flame in Wisconsin, 170; Facebook Page of Northcott Neighborhood House, accessed March 31, 2017. ^ “About Us,” United Methodist Children’s Services of Wisconsin Incorporated; Natalie Wickman, “United Methodist Children’s Services Works to De-stigmatize Poverty,” Milwaukee Neighborhood News Service, March 27, 2014. Bell, Gary William. “Social Activism in United Methodist Local Churches: Individualistic and Structural Programs and the Role of the Church in American Society.” PhD diss., University of Wisconsin-Milwaukee, 1987. Blake, William. Cross and Flame in Wisconsin: The Story of United Methodism in the Badger State. Sun Prairie, WI: Commission on Archives and History Wisconsin Conference United Methodist Church, 1973. Farina, Anthony J. “I Must, I Must, I Must”: The Story of the Italian Evangelical Church of Wisconsin. Sun Prairie, WI: Wisconsin Conference United Methodist Church, n.d.
Olsen, Lois C. All God’s Children: A History of African American Methodists. Milwaukee: Lois C. Olsen, 2007.